Much of our focus in the Drag Racing 101 series has dealt with street strip cars. And when it comes to delivering fuel, street-strip cars have to be the most difficult to deal with. Consider what’s hot on the 1320-only cars: “Big” is pretty much the operative word when it comes to drag race pumps. Proof is the huge-by-large fuel pump you’ll typically find nestled alongside the fuel cell in a contemporary Pro Stocker. It works perfectly. But where a drag race system has to operate perfectly for a few minutes at a time, a street system has to function flawlessly any time, every time and it has to work over the long haul. If you have a car that does double duty (street and strip) – fuel injected or carbureted, then you’ll be faced with a fuel delivery conundrum. If you have a big cubic inch engine between the fenders, or if you have a power-adder or two (blower, turbo, nitrous or even a combination of the three), fuel delivery becomes critical. Here’s the hitch: Those honking fuel pumps that feed a Pro Stocker don’t particularly like to run for extended periods of time. They were never designed for that purpose. They consume plenty of electricity (amps) and before long heat becomes an issue. Some electric pumps though, are quite capable of delivering fuel for extended periods of time. Case-in-point: Any of the Holley electric fuel pumps shown in the accompanying photos are just as happy to run on the street as they are on the strip. So far so good, but there are essentially two very different types of fuel delivery systems in use today – one for early carbureted vehicles (low pressure) and one for later model fuel injected vehicles (high pressure). The early cars were almost always fitted with a mechanical pump. Late models with EFI have an electric system. With EFI cars, there are usually two ways to pump the fuel – internal pump or an external pump. The most common you’ll find today is an internal pump, which is basically an electric pump submerged inside the fuel tank. Some systems and many high volume aftermarket electric fuel pumps for late model fuel injected vehicles are externally mounted (with fuel pickup lines mounted to the tank). As noted above, fuel pressure is much higher in a fuel-injected system than it is with a mechanical system. Where a carbureted combination might get away with 6-9 PSI at the needle and seat (within the fuel bowl(s) of the carburetor), a fuel injected late model needs an operating pressure in the range of 40-50 PSI at the injector (some direct injection setups such as the new Corvette with direct fuel injection start at roughly 70 psi at the tank and then the fuel is further compressed by way of a block mounted “mega pump” to an incredible 2900 PSI!). Back to the more common EFI combinations: In order for the regulator to offer this sort of pressure, then the pump must produce 70-80 PSI constantly. And it has to do so with a volume that is sufficient to supply the power demands of the engine (which basically boils down to the pounds of fuel burned every hour). 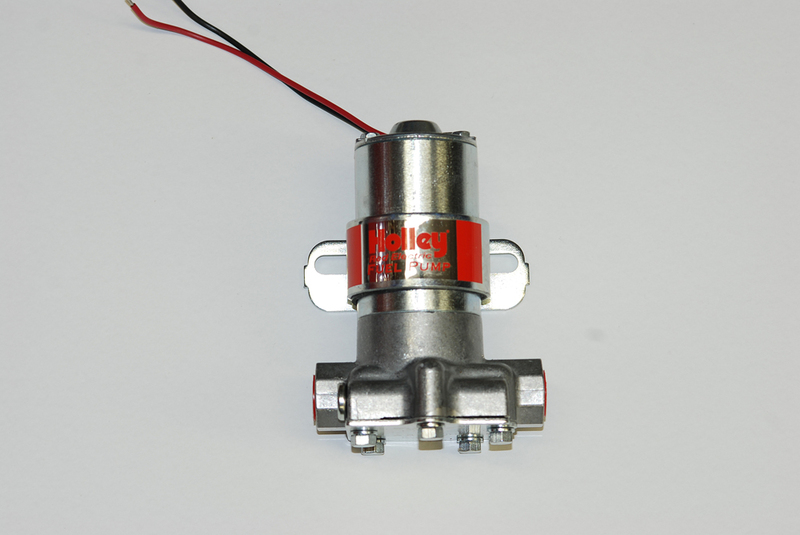 As you can see, a pressure control device of some sort is mandatory with OEM or aftermarket fuel injected fuel delivery systems. We’ll get to regulators in an upcoming issue. 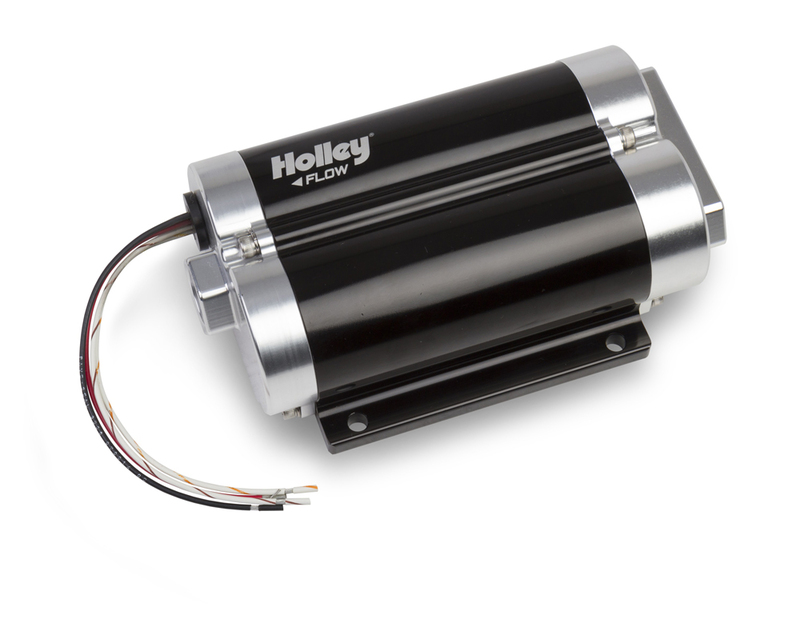 Holley’s 97 GPH (free flow) pump is internally regulated (no need for an additional regulator). As pointed out in the text, it produces 71 GPH when regulated to 4-PSI. This is one of the original Holley electric pumps that have been available for decades (although it has had periodic updates). At one time, it was the standard of all fuel pumps for carbureted applications (it doesn’t have the pressure necessary to operate an electronic fuel injection system). The pump operates by way of a rotor vane assembly (at the base), and it’s easily serviced. It is rather tolerant of fuel contamination (something to consider on the a street driven car), but it is not compatible with alcohol or methanol fuels. The pump produces 97 gallons per hour (free flow) and 71 gallons per hour when regulated to 4 PSI. The pump is fitted with an external pressure relief valve that can be set for a maximum of 7 PSI. The pump draws 2 amps of current and weighs 2.88 pounds. The next step up in electric pumps is the 140 GPH model. Here, at a regulated pressure of 9 PSI (likely too high for your carburetor needle and seat assemblies) is still 120 Gallons Per Hour. This pump mandates an external regulator. 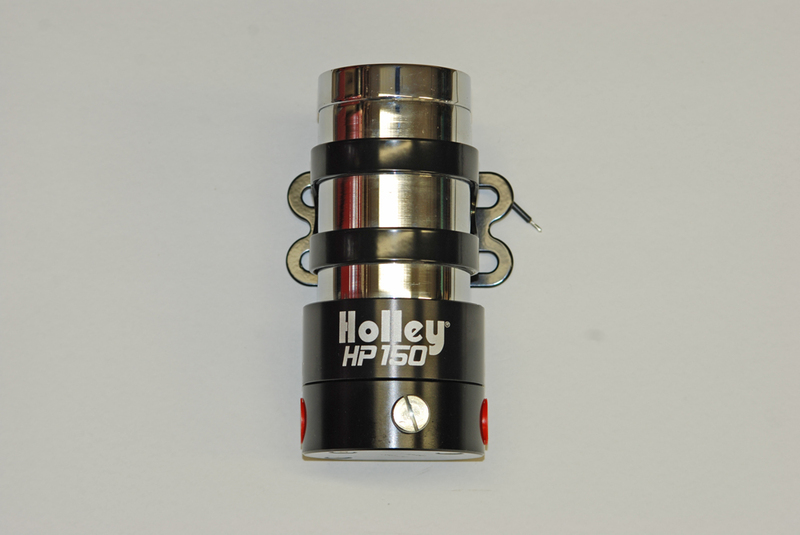 Holley’s pump with the black logo is an upgraded version of the 97 GPH pump. The lower casting has been modified for enhanced flow. Typically, this pump has a free flow rating of 140 gallons per hour while the flow at 9 PSI is still 120 gallons per hour. The pump has a maximum pressure rating of 14 PSI (set by way of the external pressure relief valve). This fuel pump does not have the pressure capability to operate an EFI system. This example is safe for use with gasoline or alcohol or methanol. An external regular is required. Holley recommends a part number 12-704 for gasoline and a 12-707 for alcohol/methanol. The pump draws 4 amps of current and it weighs 3.0-pounds. 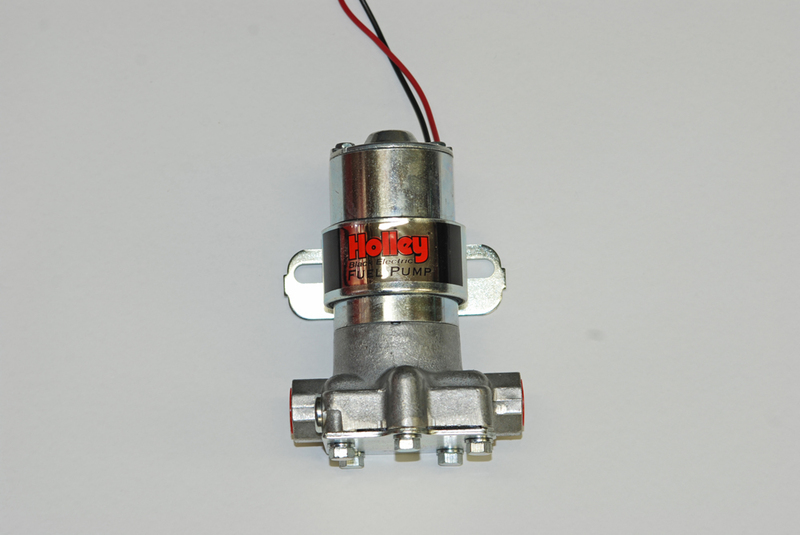 Holley’s 150 GPH (free flow) pump is internally regulated to 16 PSI. An external regulator is included (for gasoline). Regulated to 7 PSI, the pump still produces 140 GPH. The 150 GPH pump is a newer design with a gerotor setup instead of a vane (blade) style impeller. This configuration has less noise than vane impeller pumps. It has a free flow rating of 150 gallons per hour and at 7 PSI, it still flows 140 gallons per hour. The pump is compatible with gasoline along with E85 as well as other alcohol and methanol fuels. It is designed for use in carbureted applications only (there isn’t sufficient pressure for fuel injection). The pump is internally regulated to 16 PSI and it includes an adjustable fuel pressure regulator (4-1/2 to 9PSI), part number 12-803. At maximum pressure (16 PSI), the pump draws 10 amps of current. The pump is slightly larger in size than the vane style jobs (it measures 6.25-inches tall). It has 3/8-inch NPT inlet and outlet ports (the same as the previous two pumps). 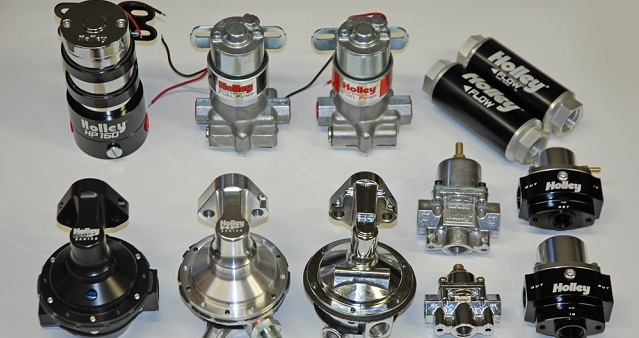 Photo Source: Holley The last pump in our selection is from Holley’s Dominator lineup. They offer several similar looking dual pumps, but all are designed for specific applications. This version designed for gasoline (pump or race gas) and depending upon the regulator you select, it can work for EFI or carbs. A big step up in streetable fuel electric pumps is the Dominator “shotgun style” dual pump setup from Holley. This pump is a twin design that allows you to use one pump for cruising and both pumps when you get on the power. You can also use the second stage of the pump when you activate the nitrous switch or, in the case of a blown or turbo motor, when it begins to build boost! With the way the pump is laid out (staging the second pump) unnecessary recirculating and heating of extra fuel is eliminated. This pump is also engineered so that it can be fully submersed within a fuel tank. In terms of size, the pump is 7.66-inches long by 5.0-inches wide by 2.5-inches tall. It weights 5.1 pounds and draws 28 amps of current at maximum performance. At a “mere” 43-PSI and 13.5 VDC the current draw is 17.2 Amps. The pump has a free flow rating of 160 gallons per hour. It can be used for either carbureted or EFI applications (the regulator choice will dictate the application). Inlet and outlet ports are -10 AN (huge!). The version shown (#12-1600-2) is compatible with pump gas or race gas. Holley has other examples that work with E85, Methanol, Alcohol or Diesel (!). That’s a wrap for this issue. 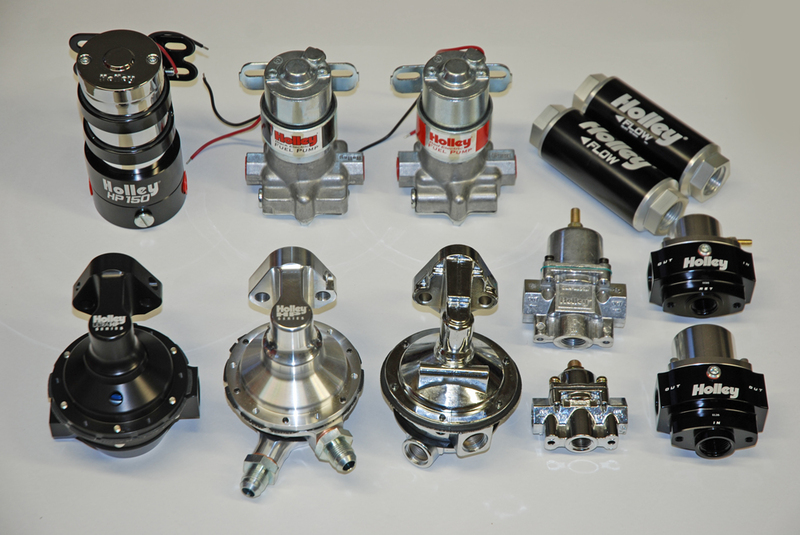 Next time around, we’ll examine a range of mechanical fuel pumps available from the folks at Holley. And don’t discount the use of a mechanical on a street-strip machine either! Some of them have plenty of capability. For a closer look at the electric pumps, check out the accompanying photos.